Join the discussion on our forums! Come discuss Pantry Spider over in our dedicated Pantry Spider discussion topic. You have to admit, they make a cute couple. 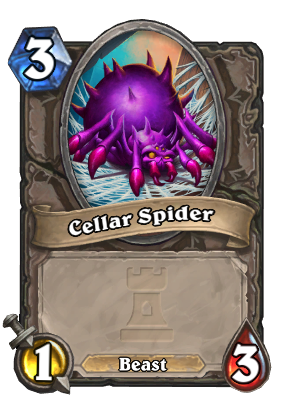 Why is the Spider token also a 3-mana card? That just seems broken in conjunction with Evolve. Not that I'm complaining, of course; it's nice that my Shaman deck of choice got a boost from Karazhan. good total stats/mana ratio. Generally weak tokens, especially against aoe, but easily good with buffs. This or carrion grub for hunter as my houndmaster combo? Why not both? It will give your deck multiple options. I was able to gain tempo in a match by playing Pantry Spider and Freezing Trap. On the following two turns, I was able to buff the Pantry Spider with Houndmasters making him a 3/5 and then a 5/7. I feel like it's a good card with great synergies. Are you going to buff Evolve Shaman!? This flushes Echoing Ooze down the drain! 2 different cards man. echoing ooze maintain any buffs to the copy as well. 2 attack and 6 health for 3 mana- not bad. They would need buffing I think to prevent them dying so easily. Defender of Argus combo will be insane. More fuel for zoo I think. Flametongue Totem and other adjacent attack buffing cards also have great synergy. This plus "Who knows what secrets we'll uncover!" = Spider Party. Add in Ball of Spiders for full gimmick effect. I think that zoo can play that card. 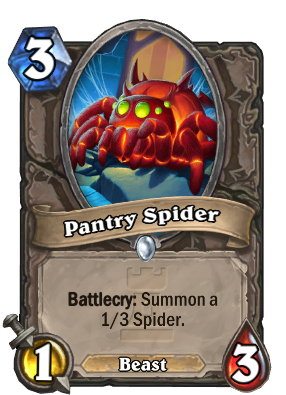 Turn 3 Pantry Spider, turn 4 Defender of Argus, also other buff cards that zoo has work well with the rather sticky body that this card has. I wonder if they ever followed any biology lessons at Blizzard... Spiders are not beasts (and I know there are already beast spiders in the game, but I just don't get how you can call these beasts). I think that, by Beast, they mean animals. And by that logic... being spiders part of the animal kingdom, both arachnids and insects count as beasts.